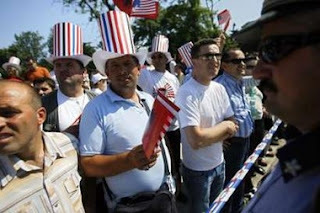 This Pro-American Muslim country was fired up for the historic visit by President Bush. They mobbed the president in the village of Fushe Kruje. “God’s Messenger” touched down in Tirana today! 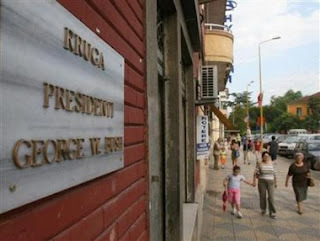 The Albanians even renamed a street after President George W. Bush for the occasion. President Bush received a hero’s welcome in Tirana, Albania today as he became the first US President to visit the staunch US ally and majoority Muslim country. When Mr. Bush arrived on his brief stop in Tirana, the hills overlooking the capital boomed as military cannons fired a 21-gun salute to the president. Thousands of people gathered in the downtown square on a brilliantly sunny day to see the president and first lady Laura Bush. 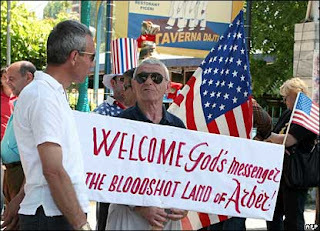 Huge banners proclaimed “Proud to be Partners,” and billboards read “President Bush in Albania Making History.” Red-white-and-blue paper top hats with stars on top were passed out to well-wishers in this Balkan nation. A herald trumpeter sounded a salute as Mr. Bush arrived at Albania’s Palace of Brigades for an official welcome, playing “The Star Spangled Banner,” reports CBS News White House Correspondent Mark Knoller. Mr. Bush was presented with an Albanian award – the Order of the National Flag – hailing him as a great ally of the Albanian people. Bush met with Albanian soldiers who served in Iraq and Afghanistan during his visit. 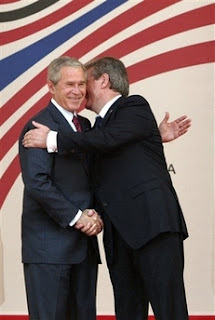 Prime Minister Berisha gave President Bush a very warm welcome as he arrived today in the Capital Tirana. PRIME MINISTER BERISHA: (As translated.) Today is a beautiful day. Today is a great day, historic for all Albanians. Among us is the greatest and most distinguished guest we have ever had in all times, the President of the United States of America, the leading country of the free world, George W. Bush. 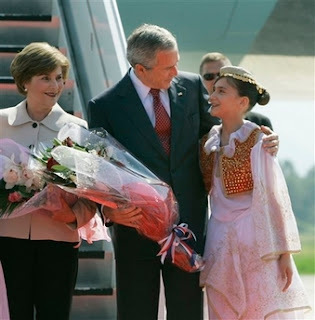 ; his lady, Mrs. Laura Bush, and their close aides. For me, it’s a great honor, and a special pleasure to thank them with gratitude and extend the most heartfelt welcome, in this historic visit, the first visit ever of a United States President in Albania. Thank you heartily, Mr. President, from the bottom of our hearts, fulfilling ardent and long-awaited wish of all Albanians to have a special guest in their home. Tungjatjeta — an Albanian word, means “may you have a long life.” This is a most traditional greeting of Albanians that I chose to greet you on their behalf, on behalf of Albanians. 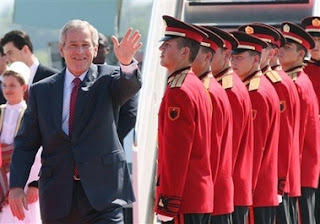 Welcome to Albania, President Bush. We have been blessed, however. We have won in all our efforts to defend our identity in Western oriented national vocation to emerge from the age of oppression to the age of dignity, from the age of darkness to the age of freedom. We have won because our just cause has always had the powerful support of the U.S.A., the greatest and the most precious friend of Albanian nation. God bless your great nation.